There are 65 items matching your search. United States. CT. Bridgeport, CT. Fairfield Co. (open 1801+). Dated 1893/05/10. 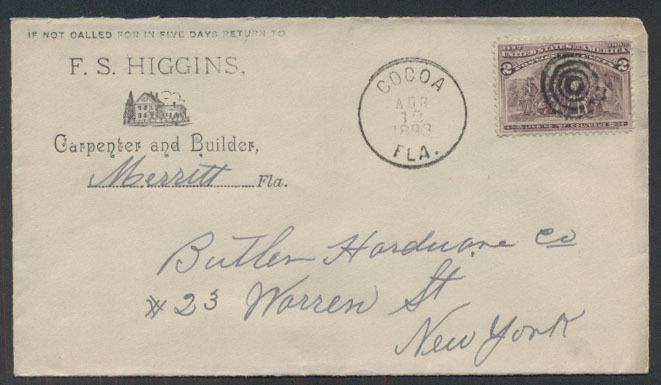 Machine cancel ties 2c (#231) on cover with illus. house + corner card for "H.H. Nettleton Builder". United States. CT. Canaan, CT. Litchfield Co. (open 1795+). Dated 1887/?. CDS & cork cancel tie 1c on cover with illus. house + corner card for "E.R. Lorrain Architect & Builder.". United States. FL. Cocoa, FL. Brevard Co. (open 1884+). Dated 1893/08/12. CDS & target on untied 2c (#231) on cover with illus. 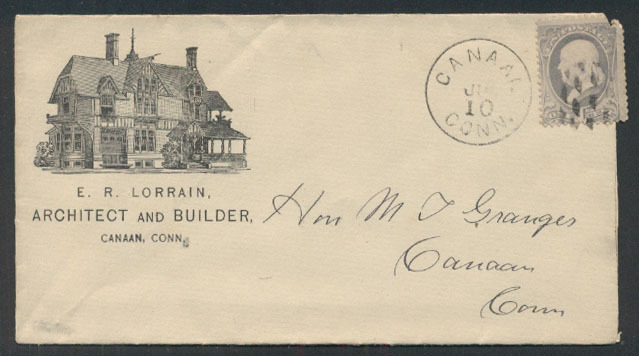 house + corner card for "F. S. Higgins Carpenter and Builder. United States. GA. Augusta, GA. Richmond Co. (open 1793+). Dated 1893/09/28. 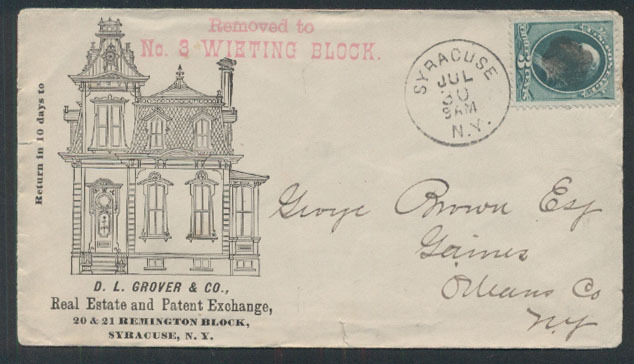 Machine cancel ties 2c (#231) on cover with illus. house in logo of "C.V. Walker, Real Estate Agent". United States. 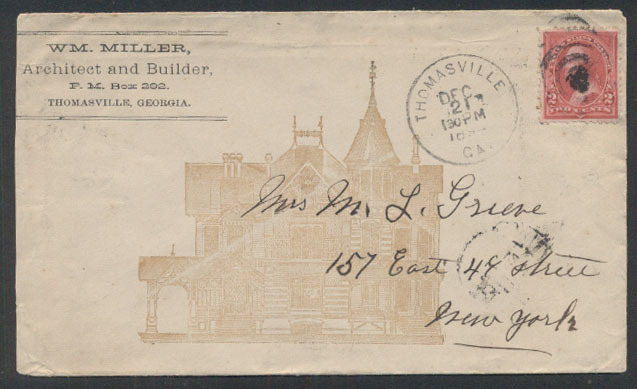 GA. Thomasville, GA. Thomas Co. (open 1827/+). Dated 1894/12/21. 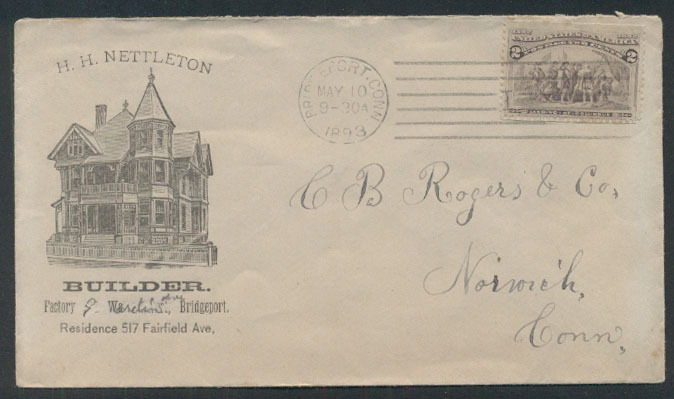 Duplex cancel ties 2c on cover with illus. house + corner card for "Wm. Miller, Architect and Builder.". United States. IA. Atlantic, IA. Cass Co. (open 1869+). Dated 1898/01/16. 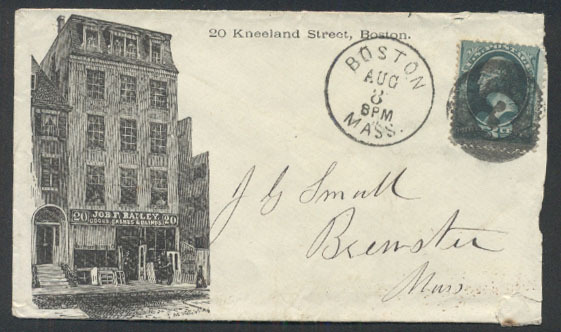 CDS & cork cancel on 2c (#213) on cover with illus. house + c/c for "I.P. 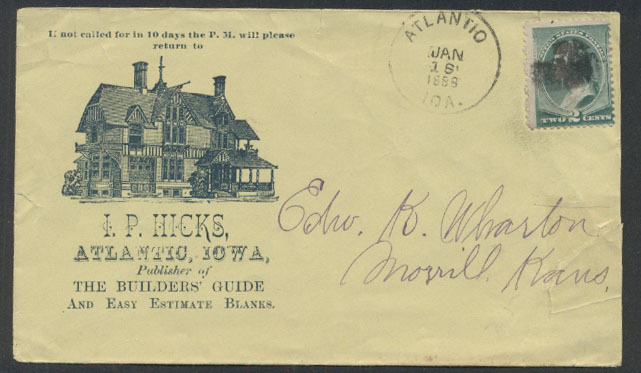 Hicks", publisher of "The Builders' Guide.". United States. IA. Des Moines, IA. Polk Co. (open 1857+). Dated 1896/04/30. 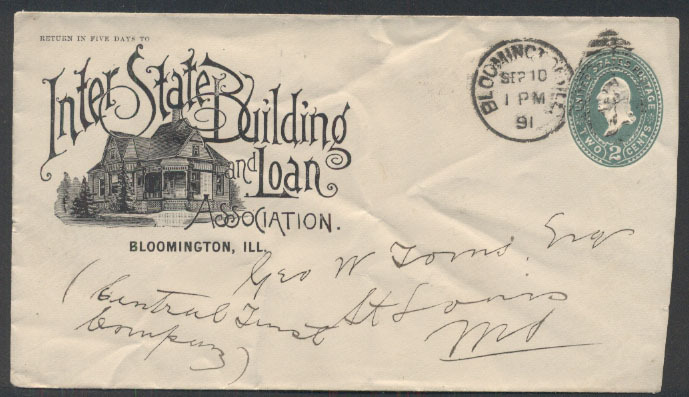 Duplex cancel ties 2c on cover with illus house + corner card for the "Iowa Building and Loan Association". United States. IL. Bloomington, IL. McLean Co. (open 1831+). Dated 1891/09/10. Duplex cancel on 2c entire with with illus. building + corner return for "Inter State Building and Loan Association. United States. IL. Chicago, IL. Cook Co. (open 1831+). Dated 1882/09/28. 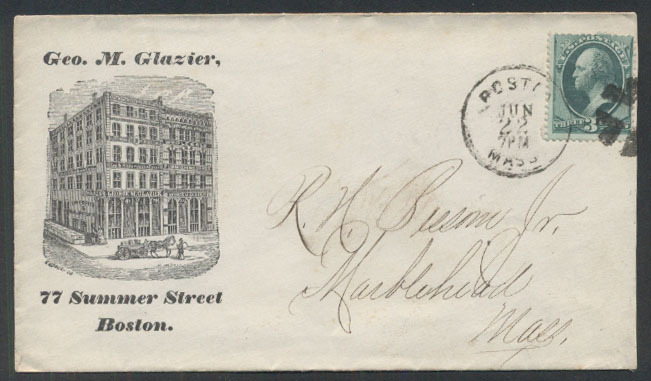 Duplex cancels ties two 1c on cover (sealed edge tears) with illus. 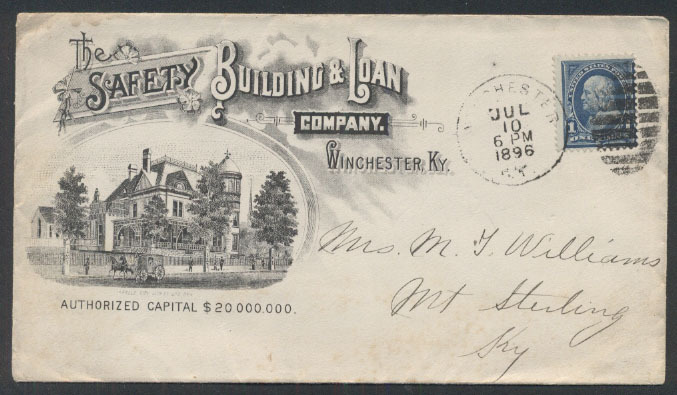 buildings + corner card for "John W. Free & Co. Real Estate and Loans.". United States. IL. Chicago, IL. Cook Co. (open 1831+). Dated 1893/10/07. CDS & cork tie 2c (#231) on cover with illus. 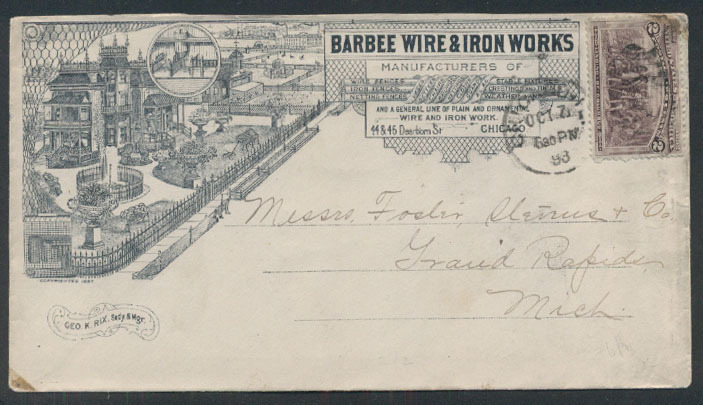 house and iron fencing + ornate return card for the Barbee Wire & Iron Works". United States. IL. Englewood, IL. Cook Co. (open 1868-1894). Dated 1893/04/10. 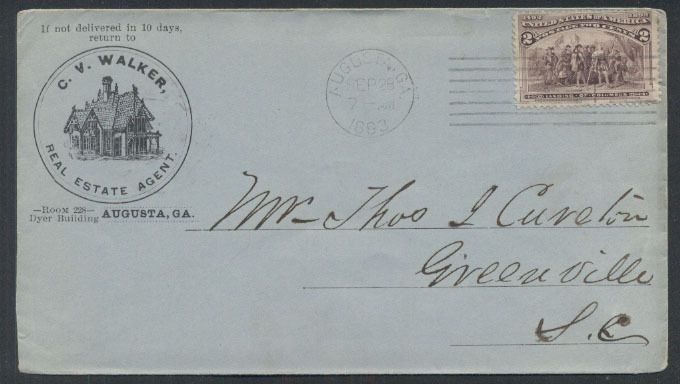 Duplex cancel ties 2c (#231) on cover with illus. house plus return for "C.H. Caldwell, Real Estate, Loans and Renting.". United States. KY. Winchester, KY. Clark Co. (open 1809+). Dated 1896/07/10. 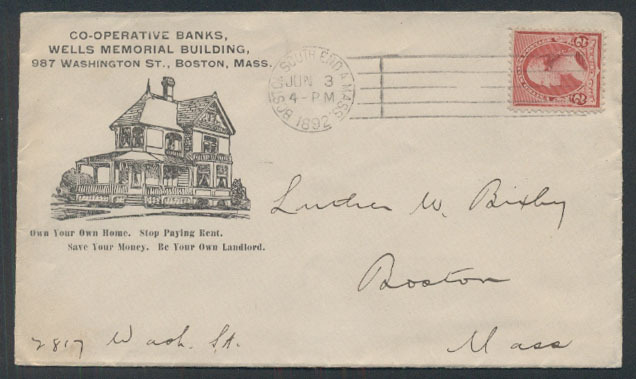 Duplex cancel ties 1c on cover with illus. 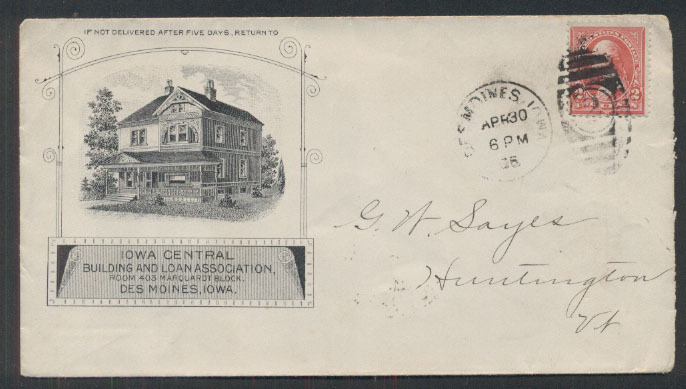 house + corner card for "The Safety Building & Loan Co.". United States. MA. Boston, MA. Suffolk Co. (open 1639+). Dated 187?/06/22. CDS & circle of v's tie 3c (#147) on cover with illus. bldg. + return for "Geo. M. Glazier". United States. MA. Boston, MA. Suffolk Co. (open 1639+). Dated 188?/05/15. CDS & negative "2" in circle tie 3c on cover (reduced rt) with illus. bldg. of "Allexander Ceppi & Co. Gilt Mouldings". United States. MA. Boston, MA. Suffolk Co. (open 1639+). Dated 188?/05/15. CDS & negative "2" in circle tie 3c on cover with illus. bldg. of "Alexander R. Ceppi Gilt Mouldings". United States. MA. Boston, MA. Suffolk Co. (open 1639+). Dated 188?/08/08. CDS & negative "3" in circle tie 3c on cover (reduced rt) with illus. bldg. of Job F. Bailey wood products. United States. MA. Boston, MA. Suffolk Co. (open 1639+). Dated 1885/06/01. American Machine ties 2c (#210) on cover with illus. 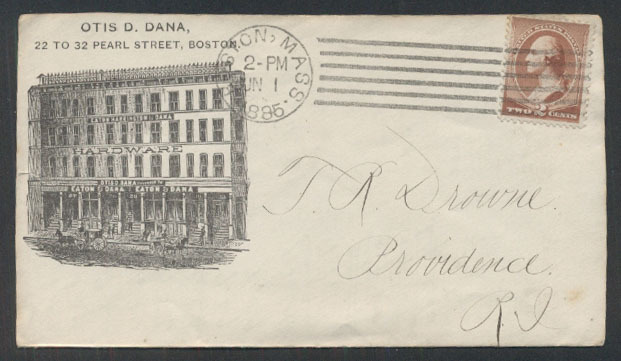 building + return for "Otis D. Dana Hardware". United States. MA. Boston, MA. Suffolk Co. (open 1639+). Dated 1887/01/24. 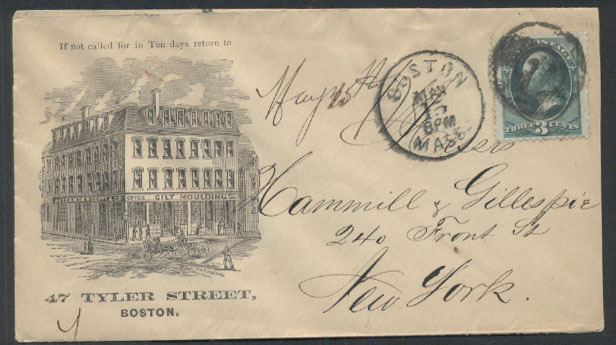 American machine cancel ties 2c (#210) on cover with illus. bldg. 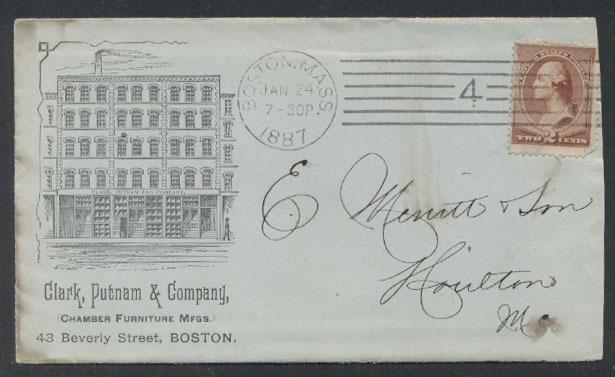 of "Clark, Putnam & Co. Chamber Furniture Mfgs.". United States. MA. Boston, MA. Suffolk Co. (open 1639+). Dated 1887/08/31. 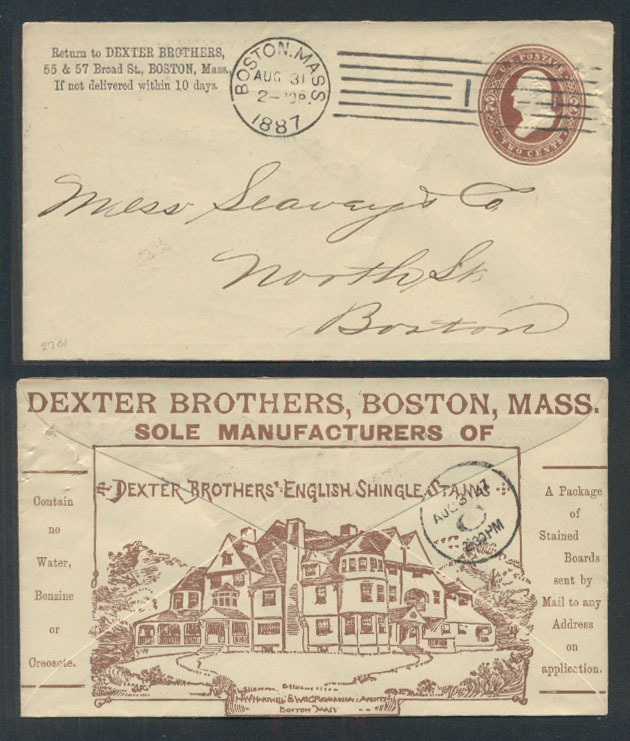 American machine cancel on 2c entire with corner card for "Dexter Brothers". Reverse with illus. house and text ads for English shingle stains. United States. MA. Boston, MA. Suffolk Co. (open 1639+). Dated 1892/06/03. 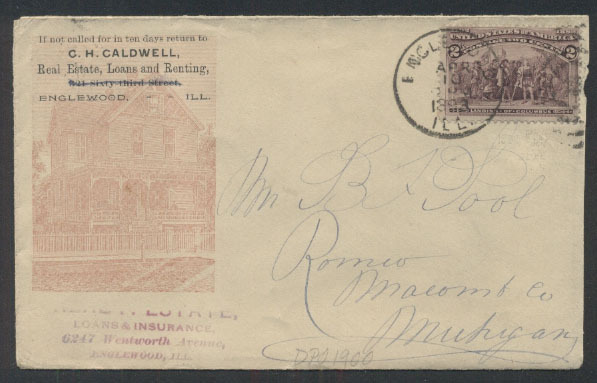 Machine cancel ties 2c (#220) on cover with illus. house & corner card for "Co-operative Banks".